Drs. Denstedt and Pautler recently returned from a very successful trip to China. Western University, under Dr. Denstedt's leadership, has partnered with West China Hospital, Sichuan University in Chengdu, China. This relationship involves knowledge exchange, professional training opportunities, and a newly developed dual degree program (Sichuan U and Western U). In the past two years, three UWO surgery residents (Cardiac, General, and Plastic Surgery) have spent several months training in Chengdu. There are plans for more Western residents to take advantage of this great opportunity in the near future. On this occasion, Drs. Denstedt and Pautler were invited guest professors for the West China Hospital Minimally Invasive Technology Forum. This was Dr. Pautler's first trip to China. "I was amazed at the high quality of specialist care in Chengdu. The lectures and live surgeries were excellent. The hospital is absolutely massive with over 5000 beds." Both Drs. Denstedt and Pautler delivered two state-of-the-art lectures on the first day of the meeting, which was attended by over 250 Urologists from Sichuan province and around the country. The second day of the forum involved multiple simultaneous live surgeries and hands on experience for the participants. During the live surgeries, Dr. Denstedt performed a complex stone case and Dr. Pautler completed a laparoscopic partial nephrectomy for a kidney cancer. 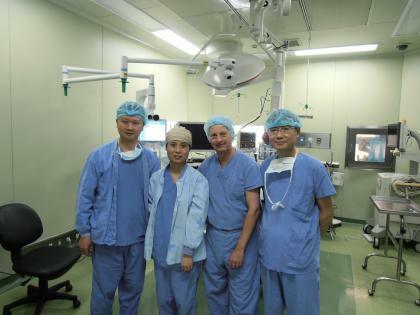 These surgeries were broadcast live to both the meeting hall and a peripheral community hospital in Sichuan province using In Touch technology from California. This was the first time this technology has been used in China and worked flawlessly. Following travel to Beijing, Drs. Denstedt and Pautler went to the Canadian Embassy and met with Dr. Felix Li, Minister Counsellor (Health) for our Federal government. Discussions included the work being done between Western and Sichuan Universities, as well as, on going development of action items from the Canada - China Policy Dialogue in Healthcare signed on September 27, 2011, in Toronto by Ministers Aglukkaq (Canada) and Chen (China). This meeting reaffirmed that the Western/Sichuan collaborations are consistent with interests of both of our governments. More collaborative events will be upcoming over the next year. Dr. Pautler summarized the trip, "It was an excellent experience and the knowledge gap between Canada and China is narrowing. I think there are many benefits to both the Chinese and to us."